1. my bare, no tan shoulders are not the BEST at my age. I purchased this sweater (the one I am wearing) at Just Fab for $19.00. And now it is $15.00. They will go fast! It's over-sized drape cowl neckline and ribbing at sleeves and bottom make it a perfect specimen for my experiment. I loved the rich wine color, thinking it would make an outstanding contrast with winter white. Then.......I paired it with a winter white turtle neck sweater and coordinating corduroy pant. It's all about taking a current trend and tweaking it to fit into your own realm of fashion. 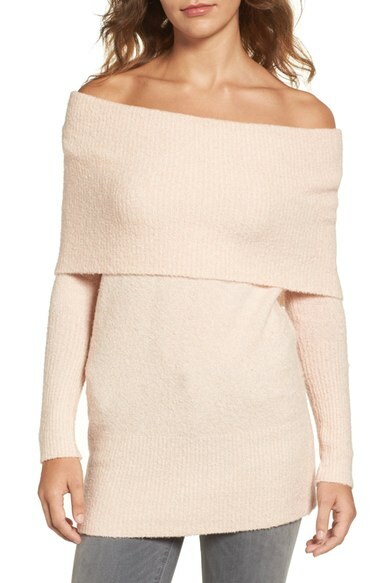 I've got to go now.............I'm off to buy another "off the shoulder" sweater! I found these beautiful sweaters at Chico's and they are all on sale. BE BRAVE try one.